Las Vegas is the strangest place on this weird old planet. It's a prime example of the peculiarities of humanity, the highs and the lows. It was picking up lobsters. Straight out of the tank. 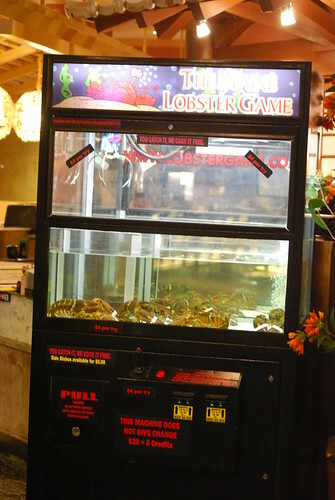 Pay $4 and if you manage to grab a squirming crustacean, your dinner is free. It was really quite disturbing, imagining the lobsters scurrying away from the descending claw, in some obscene parody of a scene from Toy Story. Vegas is definitely a city of extremes. I was surprised there weren't one-armed bandits in the toilet cubicles. that doesn't seem right, somehow. I love eating lobster, but I don't want mine terrified to death before it hits the water. Bloody hell. I've been watching a few episodes of the Las Vegas TV series recently (picked up some ex-rental DVDs very cheap) and I knew the place was crass, but that is just sick. There are some of those machines in Auckland, too. I think they're cruel.